Motivation: Something weird happened today, I was asked to setup remote debug mechanism on our test server so that developers can step through code in their machine while execution takes place on test environment sitting in other city. I never imagined need of remote debug to actually debug a code on remote machine. Steps: $JETTY_HOME denotes the directory where Jetty is installed/copied/extracted. 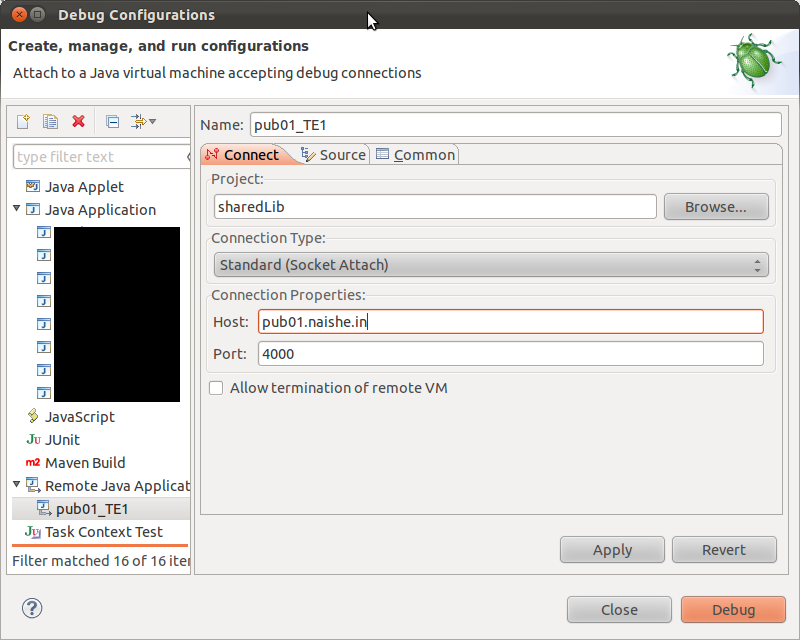 Connecting to Remote Debugger: In Eclipse, go to Run > Debug Configurations... menu. Double click Remote Java Application, give an appropriate name, link to relevant project, provide the host-name, mention the port that you have started your remote debugger on. So, from step#1, in my case this will be 4000. A word about firewall: Since it makes TCP connection to your Jetty make sure, you have debug port -- 4000, open on the host machine. In AWS EC2, you can allow port 4000 in your security group. You can always forward a port with ssh, this way you don't need to open a port in your firewall.